Symbolising a beautiful bond of friendship and love, the heart Affinity stacking ring features a band of connecting hearts on life's journey together. Our Affinity rings provide versatile pieces of jewellery, beautiful alone or stacked together. This sublime 9ct rose gold ring contains rare Welsh gold - the Gold of Royalty for over 100 years. 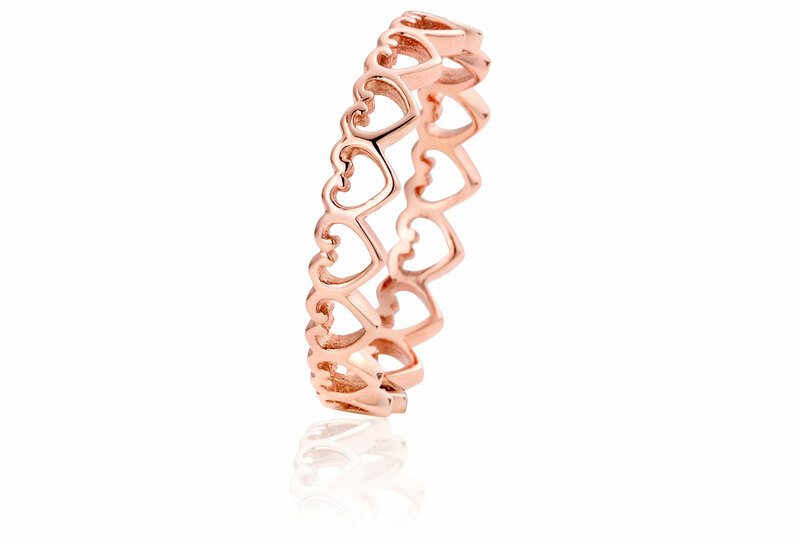 Love My Clogau Heart ring. Saving to buy another! Love this ring. Love Wales & my memories of wonderful holidays in North Wales & the Clogau Gold everywhere. Saving to buy another ASAP. So delicate, such a beautiful colour gold. The quality of the ring is excellent and so beautifully made.. I purchased the Heart Affinity Stacking ring in Rose Gold for my daughter for a special memory. The size she wanted was out of stock but a delivery came in just one working day after the date you expected it. I rang a few times to check the status of the order and spoke to several of your staff. They were helpful and understanding at all times giving me as much information as they could, including when the delivery of stock was in. I was told when the ring was despatched and received it safely. The quality of the ring is excellent and so beautifully made. My daughter is delighted with it. In her words 'I love it, it's just perfect, thank you'. I have been very pleased with your service and will definitely order from you again. Many thanks for all your help. Happy customer. The ring is beautifully made and service was excellent. When I ordered this ring for my daughters 18th birthday her size was out of stock and it would not be delivered before her birthday. I ordered it anyway because it was the ring she wanted. I was very surprised and happy when the ring became available, dispatched and arrived for my daughters birthday. She was overjoyed and I was a very happy dad. I am very happy with Clogau, the ring is beautifully made and the service I have received is excellent. The whole purchasing experience has been brilliant as usual with Clogau. The ordering system was very easy to negotiate and the ring was received within 2 days. On arrival the ring was exactly as described in the catalogue and was in perfect condition in a beautiful wooden box. On receipt of the ring the Free 2 year warranty was easy to register and full documents provided on-line instantly. The whole purchasing experience has been brilliant as usual with Clogau.